Brendan Lamb had six points, four rebounds and six assists for Clinton-Massie Tuesday night. 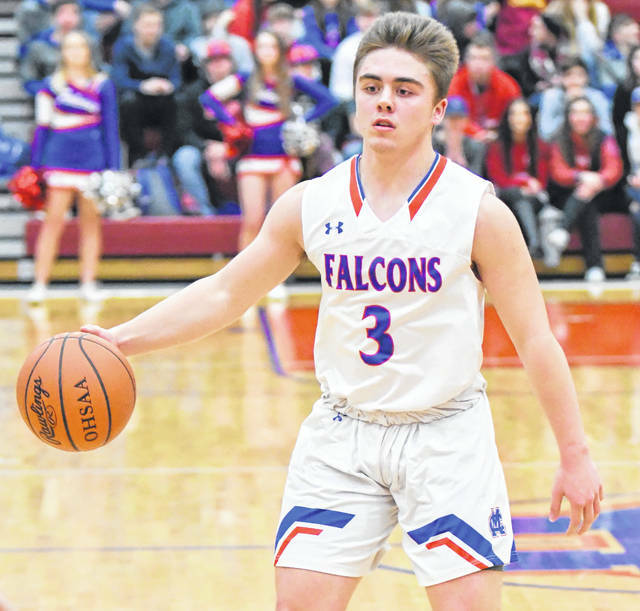 GOSHEN — Clinton-Massie’s defense held the fort Tuesday night until the Falcons’ offense busted loose. When that happened, a league title was secured. Clinton-Massie exploded for a 14-0 run in the third quarter to finish off Goshen and clinch an outright SBAAC American Division title. The Falcons prevailed 66-45. That result, coupled with Wilmington’s 67-58 loss at New Richmond, ended the American Division race. Knowing what Goshen was capable of from the outside, Cook and his team focused in practice on taking away the Warriors’ time from long range. Clinton-Massie (14-3 overall, 7-1 SBC) took the lead midway through the first quarter and steadily pulled away for the remainder of the half. The Falcons led 27-15 at the break. Goshen (9-9, 4-4) hung around, pulling within 32-23 with 4:11 left in the third quarter. Cook called a timeout, and the Falcons ran off the next 14 points to put the game out of reach. Griffin Laake paced the Falcon attack with 20 points. He also had eight rebounds, five of them offensive. Zach Chowning added 14 points. Brendan Lamb had six assists while Drew Settlemyre pulled down 12 rebounds. Victor Hill led Goshen with 16 points on 7 of 9 shooting. The rest of the Warriors struggled from the floor, especially behind the three-point arc. Goshen made just 6 of 34 shots from the outside. Take away Hill’s 2 of 4 from long range, and the rest of the team was just 4 of 30 (13.4 percent). It was the first league championship for the Falcons since they won the South Central Ohio League title in 2012-2013. Cook is pleased with the accomplishment, but they have other goals in mind. “It’s a great accomplishment,” Cook said. “We’re probably going to be setting records throughout the season. With my 100 wins, with Thomas Myers’ 1,000 points and now a league title, we haven’t had a district title (in a long time). That’s our next goal. The Falcons played Tuesday’s game without Myers, who according to Cook, was suspended due to a violation of team rules. (66) CLINTON-MASSIE (fg-3fg-ft-tp) Daulton Wolfe 1-0-0-2, Brendan Lamb 2-0-2-6, Zach Chowning 5-4-0-14, Austin Faucett 2-0-7-11, Tate Olberding 0-0-1-1, Nate Baker 2-0-2-6, Griffin Laake 7-1-5-20, Spencer Voss 1-0-0-2, Drew Settlemyre 1-0-2-4. TOTALS 21-5-19-66. (45) GOSHEN (fg-3fg-ft-tp) Hunter Slusher 1-1-4-7, Christian Kollmorgen 6-1-1-14, Bradley Moore 2-2-0-6, Josh Hice 1-0-0-2, Victor Hill 7-2-0-16. TOTALS 17-6-5-45.